Blueberry Turkey Bacon is a HIT! This was an unexpected treat. 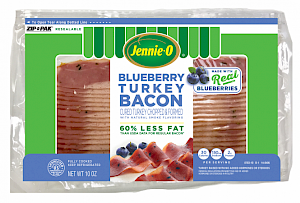 Blueberry turkey bacon? Seriously? Try it. Made with real blueberries. I cooked in a skillet over medium for 6 minutes and came out great - not greasy at all - and while I didn't get the blueberries, I did after one bite. One slice, but who eats just one? is just 30 calories, 2 grams of fat, 150 mg of sodium, which is too high, no sugars and 2 grams of protein. Turkey raised with no added hormones or steroids as is all turkey. Actually has 60% less fat than pork bacon. Not as greasy or crispy - but go on, give it a try and let me know what you think. Like the ziplock package.